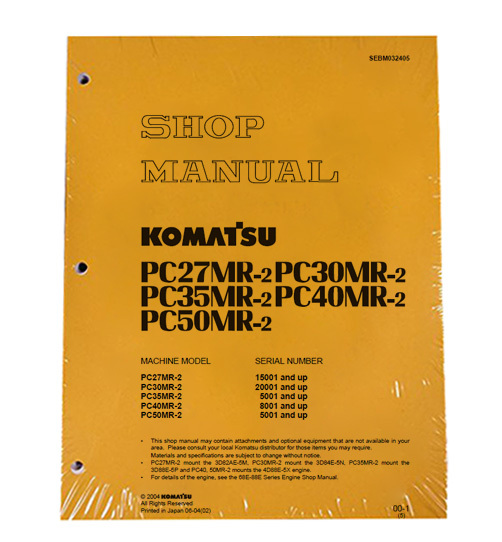 Komatsu PC27MR-2, PC30MR-2, PC35MR-2, PC40MR-2 & PC50MR-2 Hydraulic Excavator Service Shop Repair Manual. The Service shop repair manual offers detailed servicing instructions and will give you complete step by step information on repair, servicing, preventative maintenance & troubleshooting procedures for your Komatsu excavator. This comprehensive service manual features photos and illustrations along with step-by-step instructions that will guide you through the entire repair process. This manual contains all you need to know to keep your Komatsu PC27MR-2, PC30MR-2, PC35MR-2, PC40MR-2 & PC50MR-2 Hydraulic Excavator working correctly. You will find that this manual is a indispensable source of detailed maintenance and repair information and is the only service repair manual you will need for your Komatsu Excavator. It will help you better understand, care for, and overall will lower the repair and maintenance cost for your Komatsu PC27MR-2, PC30MR-2, PC35MR-2, PC40MR-2 & PC50MR-2 .